Gowise USA has come up with a large capacity hot air fryer to cater to the larger families or those who would love to cook more than what is offered by their smaller capacities air fryers. The smaller capacity Gowise air fryer is better suited for singles or couples. The GoWISE USA Electric Programmable Turbo Air Fryer comes with a large capacity of 10.5 qt cooking capacity. Their recent upgraded model 4th. generation digital air fryer only has 3.7 qt or the XL digital fryer with 5.8 qt capacity. Their small capacity hot air fryer comes with a 2.75 qt capacity and is perfect for your college son or daughter or those who stay alone. The turbo fryer comes with 4 included accessories and a separate accessory package that you have the option to buy separately. If you’ve been cooking simple stuff like French fries and wedges, now with this large capacity air fryer, you can try roasting a whole chicken using the included rotisserie fork. Spit roast pork ribs minus the oil and mess roast to perfection is possible with the GoWise turbo air fryer. With the extra accessories included, now you can also start experimenting with more varieties of recipes. Be the gourmet chef and surprise your family with restaurant style meals. And the best part is you do not need to add lots of oil and your kitchen is clean as well as grease-free. The turbo air fryer uses radiant heat to cook the food inside the cooking chamber. The heat waves from the heating element (halogen bulb) are radiated directly to the food ingredients, heating them up. Radiant heat produces wonderful browning of your food too. With its large 10.5 qt capacity, you can cook about 11 pounds of food at the same time. 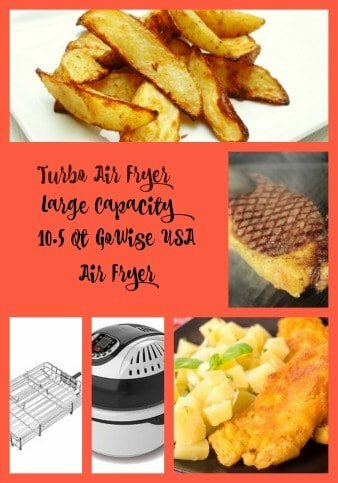 Cooking for a large family or large gathering of friends is made simple with this GoWise turbo air fryer. With featured cooking modes such as bake, roast, fry and stir-fry, cooking meat and vegetables as well as cakes, pies and pizzas are possible. Compared to the rest of the GoWise air fryers, the turbo fryer has 2 unique modes – ‘defrost’ and ‘turbo’ modes. With the defrost mode, you can now cook frozen raw meat. The other fryers can only cook frozen baked foodstuff or raw meat that has been thawed. With more function modes, its 360 degrees heating technology and a large capacity, your cooking choices are truly endless. You can deep fry your favorite comfort food without additional oil needed or just a tablespoon of oil. You do not need a big convectional oven to bake your cakes and muffins. The air fryer can do it and faster too. Reheat your leftover pizza or roast chicken to its original crispness. 10 minutes is all it takes. You can also cook rice inside the non-stick pot itself. It will just take about 10 – 15 minutes at a temperature of 200°F. The air fryer is all about fast, low fat cooking and very mess free. Sounds great, right? It is. Healthy cooking with the GoWise turbo air fryer is a guilt-free way to feed your family and loved ones. The adjustable cooking temperature ranges from 120°F – 450°F. This is a wide range of temperature choices. You can set the timer to a maximum of 60 minutes. The turbo fryer gets a new delayed timer option not available in the other GoWise fryers. You can set a delayed cooking time of up to 10 hours. You get a choice of 8 cooking modes namely roast, bake, stir-fry, fry, roll/spin, delay timer, defrost, turbo. These come preset with time and cooking temperature. Turbo and fry mode come with the highest preset temperature of 450°F and a cooking time of 15 minutes. Defrost is set at 140°F and a time of 15 minutes. For defrosting, you’ll need to put your frozen food on the rack that is included. You can also manually adjust your own preferred time and temperature. The heating element will adjust the temperature automatically to maintain a constant temperature inside the cooking chamber during the whole cooking process. The turbo air fryer comes with a Calphalon coated non-stick pot which is easy to clean. 4 types of accessories are included in this package. 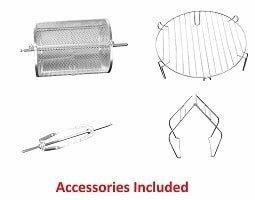 These include a wire rack, baking cage, a pair of food tongs and a rotisserie stake. These greatly expand your cooking options. With the wire rack, you get an additional cooking surface level. You can cook more food at the same time. You place your food ingredients on top of the rack and the rack sits on the non stick pot. This ensures that hot air can circulate underneath the food thus cooking them in all directions. You can even air fry boiled eggs using the rack. Make sure to put some water in the pot. The baking cage is great for frying small food items such as French fries, cut vegetables, chicken nuggets, roasting nuts etc. If you love popcorn, then you’ll really love this baking cage. Do not overfill as there has to be enough space for the food to tumble or roll in the cage. 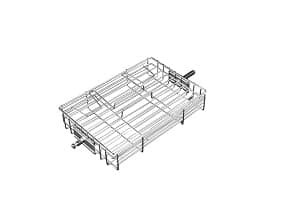 The cage will rotate 360 degrees with the food tumbling inside the baking cage. This results in even cooking and browning with not much work on your part. The rotisserie stake or fork is especially useful for roasting a whole chicken or any large slab of meat. Chicken is rotated continuously inside the fryer and the end result is succulent crispy skin chicken. It takes about 30 minutes at a temperature of 390°F. The tongs are useful for retrieving cooked food from the hot fryer. You can use it to remove the baking cage from inside the fryer too. Besides the 4 included accessories, there are also 3 more accessories that you have the option to buy separately. 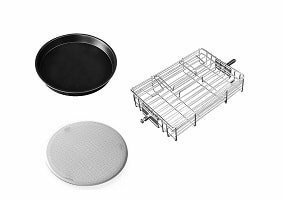 These are the steak cage, baking pan and filter pan. You can order these on the same Amazon page that you order your turbo air fryer. These are sold as a package and not as individual items. Use the baking pan for cakes or any recipes that come with a sauce. The pan should sit on the wire rack inside the fryer for better air circulation from all directions. This is great for roasting steak, fish or even toasted sandwiches. Your piece of steak will only take about 12 – 16 minutes at a temperature of 380°F. Fancy baked fish for dinner? Just pop the fish in the steak cage, set timer to about 15 minutes and temperature to 410°F. Quick and fuss free! Your toast will be ready in about 5 – 8 minutes at a higher temperature of 450°F. What a fast and hassle free way to prepare breakfast when rushing to work in the mornings. Filter pan protects your heating element from splatters and prolong its lifespan. The fryer comes with a catch lock at the side that prevents the lid from falling when opened. To close the lid, press the lock to release the locking mechanism. Etl certified – that means the turbo fryer has been independently tested and certified safe according to North American safety standard. Make sure there is at least 5″ of free space all around fryer as well as on top. 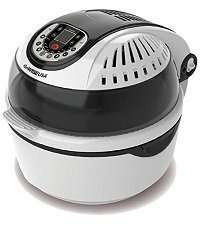 Judging from the customers reviews, the GoWise electric programmable turbo air fryer seems to deliver what it promises. The rotisserie feature is highly recommended for roasting the best chicken ever. Healthy, quick and easy is a common feedback of the air fryer. If you’re looking for a large capacity air fryer with rotisserie feature, then you should check this out.